An elite academy has been built on Nantucket, a reform school that teaches ethical and moral principles to private school students. The students are the best-of-the-best, future leaders of the free world, but they are sent to Woodward Academy against their will, having tested positive on a genetic test that measures their predisposition for unethical behavior. Montgomery Shields, a high school senior in Cambridge, Massachusetts, has not tested positive. An eagle scout, star athlete and honor roll student, he’s the moral center of his class. And yet he faked the genetic test, and admitted himself to Woodward Academy on his own volition. His father, a renowned cancer biologist, has fabricated data for a new, FDA-approved cancer drug that’s hailed as a cure. Montgomery’s reality is shattered when he privately discovers that his father is a fraud. Just as Montgomery arrives at Woodward, his father is arrested by the FBI and stripped of his achievements, prestige and honor. As the family’s name disintegrates, so does Montgomery’s faith in his own virtue. Can he find his moral compass at Woodward, or will the sins of his father forever haunt his destiny? 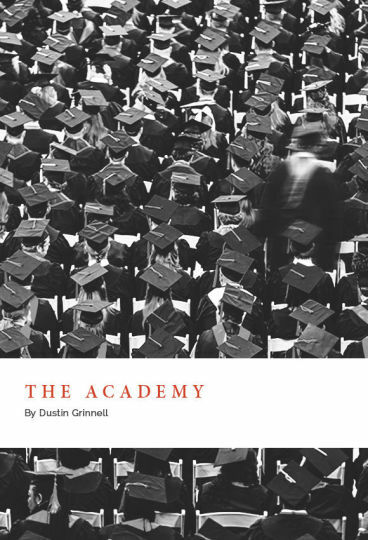 I have a finished the treatment for The Academy, and have begun writing the script. If you’re interested in reviewing the treatment, or the screenplay when it’s complete, please contact me at dustin.grinnell [at] gmail.com.